Where is the superior colliculus? There are two superior colliculi in the midbrain. They are symmetrically positioned, one on either side of the midline of the brainstem; they form two bumps on the posterior external surface of the brainstem. The superior colliculi are just below the thalamus and above the two inferior colliculi. The superior colliculus is often referred to as the tectum or optic tectum in non-human vertebrates. What is the superior colliculus and what does it do? Although the complete scope of functions that can be attributed to the superior colliculi has not been fully delineated, the superior colliculi are understood to be important to directing behavioral responses toward stimuli in the environment. In other words, the superior colliculus seems to be able to receive information from the environment and then use that information to initiate a behavioral response appropriate to the current environmental context. For example, if you were sitting in the stands at a baseball game and someone hit a home run, you would follow the ball with your head and eyes. This behavioral response to an environmental stimulus would involve the superior colliculi. In fact, eye and head movements like this are the most-studied function of the superior colliculus, but the structure is thought to be involved in a variety of other responsive movements as well. The superior colliculus is made up of several layers of cells, which anatomists have divided into what are called superficial and deep layers. The superficial layers seem to primarily receive visual information from the retina and the visual cortex, while the deep layers receive information from the auditory, visual, and somatosensory systems. The deep layers also appear to be where the motor functions of the superior colliculus originate, as stimulation of neurons in these layers can produce a variety of movements. The different layers of the superior colliculi contain what are known as topographic maps for the sense modalities they process information from. The term topographic map in neuroscience is used to refer to an organization where sensory input from a particular region of the body is sent to a specific area of the central nervous system. For example, information from a particular part of the visual field is sent to a corresponding region of the superficial layers of the superior colliculus. Because all of the layers of the superior colliculus have a similar topographic arrangement, it allows for the rapid integration and enhancement of signals that arrive via multiple sense modalities (e.g. vision and hearing). Additionally, because the motor areas of the superior colliculus have the same topographic arrangement as the sensory areas, it allows for the rapid initiation of motor responses to incoming sensory information. In many other vertebrates (e.g. fish, birds), the superior colliculus is one of the largest brain regions. In humans this is not the case, as it is dwarfed by a number of other structures. Despite its relatively small size, however, the superior colliculus plays a very important role in integrating sensory information and quickly triggering behavioral reactions to it. King AJ. The Superior Colliculus. Current Biology. 2004;14(9):R335-8. primary visual cortex (in red). The primary visual cortex is found in the occipital lobe in both cerebral hemispheres. It surrounds and extends into a deep sulcus called the calcarine sulcus. The primary visual cortex makes up a small portion of the visible surface of the cortex in the occipital lobe, but because it stretches into the calcarine sulcus, it makes up a significant portion of cortical surface overall. The primary visual cortex is sometimes also called the striate cortex due to the presence of a large band of myelinated axons that runs along the eges of the calcarine sulcus. These axons, referred to as the line of Gennari in reference to the first researcher who made note of their presence in the late 1700s, make the primary visual cortex appear striped (striate comes from Latin and implies a striped appearance). What is the primary visual cortex and what does it do? The primary visual cortex, often called V1, is a structure that is essential to the conscious processing of visual stimuli. Its importance to visual perception is underscored by cases where patients have experienced damage to V1; these patients generally experience disruptions in visual perception that can range from losing specific aspects of vision (e.g. depth perception) to complete loss of conscious awareness of visual stimuli. When visual information leaves the retina, it is sent via the optic nerve (which soon becomes the optic tract) to a nucleus of the thalamus called the lateral geniculate nucleus. From there, it is carried in a tract often called the optic radiation, which curves around the wall of the lateral ventricle in each cerebral hemisphere and reaches back to the occipital lobe. The axons included in the optic radiation terminate in the primary visual cortex in what is called a retinotopic manner, meaning that axons carrying information from a specific part of the visual field terminate in a location in V1 that corresponds to that location in the visual field. For example, axons carrying information about the inferior portion of the visual field terminate in areas of V1 that lie above the calcarine sulcus, while those that carry information about the superior portion of the visual field project to areas below the calcarine sulcus. These projections to the primary visual cortex from the thalamus travel along at least three distinct pathways. One pathway arises from large neurons in the retina called magnocellular, or M, cells; another pathway projects from smaller neurons called parvocellular, or P, cells; and a third pathway travels to V1 from small neurons called koniocellular, or K, cells. These different types of neurons preferentially respond to different types of visual stimuli, thus it seems these pathways are each somewhat specialized for specific categories of stimuli. M cells, for example, seem to be specialized to detect movement (e.g. location, speed, and direction of movement of a moving object). P cells appear to be important for spatial resolution (e.g. shape, size, and color of an object) and are also involved in color vision. The functions of K cells are still not fully understood, but they are thought to be involved with some aspects of color vision. Neurons in the primary visual cortex are arranged into columns of neurons that have similar functional properties. For example, neurons in one column might respond primarily to stimuli that have a certain orientation (e.g. upright vs. horizontal) and are perceived by the contralateral eye. Neurons in another column might also respond primarily to upright orientation, but only when the information is coming from the ipsilateral eye. These columns of neurons are themselves collected into assemblies sometimes called modules; each module contains an array of neuronal columns necessary to analyze one small area of the visual field. Thus, to complete the visual scene, the primary visual cortex has many of these modules under the cortical surface. The areas of the occipital lobe surrounding the primary visual cortex are also primarily involved with vision. Sometimes collectively referred to as extrastriate cortex, the function of these areas in relation to the primary visual cortex is not fully understood, but they are thought to play important roles in visual processing. One popular conceptualization of how the primary visual cortex is functionally linked to the extrastriate areas is that there are two main pathways by which information travels from V1 to the surrounding visual areas. 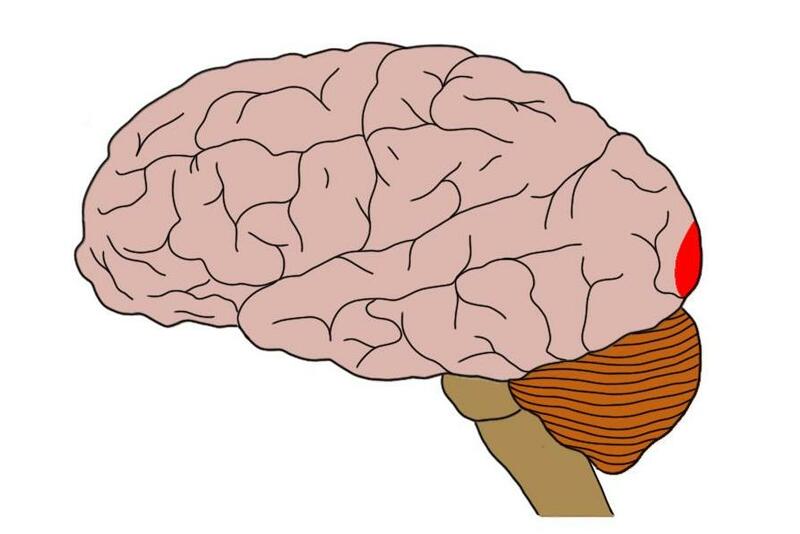 One pathway, referred to as the ventral stream for its path along the ventral portion of the brain, passes from V1 to the extrastriate areas and on to the inferior part of the temporal lobe; it is thought that the ventral stream primarily carries information involved with object form and recognition. A second pathway, the dorsal stream, travels from V1 to the extrastriate areas and then to the posterior parietal lobe; it is thought to be involved with perceiving motion and spatial relationships between objects in the visual field. Sometimes the ventral stream is called the "what" pathway due to its role in identifying objects, while the dorsal stream is called the "where" pathway because of its involvement in analyzing the movement of those objects. Although a great deal is known about the primary visual cortex and the visual system in general, there is still much to be understood about how activity in different areas of V1---and activity in the extrastriate areas---comes together to coherently reproduce all of the intricate characteristics of a visual scene. The visual areas of the brain are a great example of just how complex the brain is, for they have probably been studied more than any other brain region, yet there are still many unanswered questions about exactly how they work to create the rich experience we call visual perception.